(La Serena, Chile, October 30, 2017) From October 26 to 28 FONTAGRO’s Board of Directors held its Twenty-first Annual Meeting in La Serena, Chile. At the meeting, project financing was approved for the region. 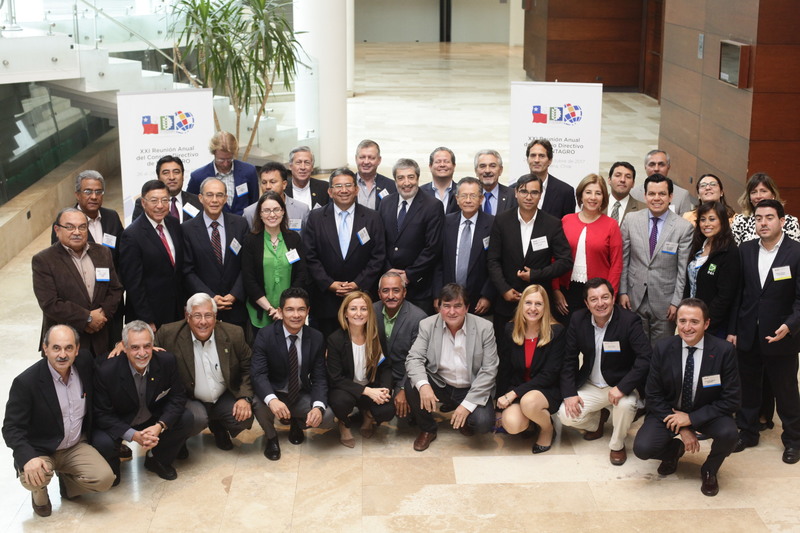 The meeting was hosted by Chile’s Agricultural Research Institute (INIA) and it was attended by representatives of member countries from Argentina, Bolivia, Chile, Costa Rica, Colombia, Dominican Republic, Ecuador, Honduras, Nicaragua, Panama, Paraguay, Peru, Spain, and Uruguay; as well as representatives from El Salvador, Guatemala, and Mexico, as special guests. The meeting was preceded by the Sixteenth Ibero-American INIA System Meeting, which was held before FONTAGRO’s meeting for the third consecutive year. During the meeting, four regional projects were awarded grants under the 2017 Call for Proposals on “Innovations for the sustainable intensification of family agriculture in response to climate change” were approved. The approved projects included scaling up an initiative that won FONTAGRO’s 2015 Competition for Successful Cases, aimed at training children, as well as their families, in rural areas of the Peruvian-Bolivian Altiplano. The project seeks to empower families, and especially children as future farmers and agents of change, in family farming and adaptation to climate change. Another project will establish a network of specialists to develop an early warning system for potato late blight, a disease that is exacerbated by climate change and produces up to 100% crop losses. Specialists from Chile, Argentina, Ecuador, and Panama participate in this project, with the support of IICA. One project aims at improving family farm production of meat, wool, and milk while adapting to climate change in six locations of Argentina, Peru, and Venezuela. Lastly, a project presented by the Colombian rice farmers association with the support of universities and research institutes in the region, including FLAR/CIAT, will develop a new irrigation system to reduce greenhouse gas emissions and improve productivity and water efficiency. FONTAGRO will provide a total of $1.2 million in funding, and project proponents will invest more than $3.44 million as matching funds. FONTAGRO’s Board of Directors decided to support the regional implementation of its knowledge management and result dissemination strategy, as well as improve the flow of information to FONTAGRO’s internal and external audiences. At the meeting, FONTAGRO’s Board of Directors also approved financing for a joint project on the use of legumes in livestock systems, presented jointly by PROCISUR (Cooperative Program for the Development of Agricultural Technology in the Southern Cone) and other FONTAGRO members. The project will support a cooperation platform and includes studies on the effects of the use of legumes on soil quality, nitrogen fixation, and greenhouse gas (GHG) emissions. The project is jointly implemented by Argentina’s INTA, Chile’s INIA, Uruguay’s INIA, Paraguay’s IPTA, Ecuador’s INIAP, Nicaragua’s INTA, the Dominican Republic’s IDIAF, and Embrapa. During the meeting, the representative of the Global Research Alliance on Agricultural Greenhouse Gases (known as the Global Research Alliance or GRA) stated that the GRA could provide FONTAGRO member countries with financing for performing analyses, carrying out training, and supporting PhD scholarships on the subject. Lastly, FONTAGRO’s annual operating plan, investment plan, and budget for next year were approved. The board thanked Dr. Hugo Li Pun, who is completing his second term as Executive Secretary. Within the framework of its preceding meetings, FONTAGRO elected its new Executive Secretary, Dr. Eugenia Saini who currently serves as FONTAGRO’s administrator. Read more here. For more information, you may email your queries to fontagro@iadb.org. FONTAGRO is a unique regional cooperation mechanism that promotes family agriculture, competitiveness, and food security. It was established in 1998 and it includes fifteen member countries that have contributed a capital of some $100 million. FONTAGRO is sponsored by the Inter-American Development Bank (IDB) and the Inter-American Institute for Cooperation on Agriculture (IICA). Its Technical Administrative Secretariat is based at IDB headquarters in Washington, D.C. FONTAGRO has cofinanced more than 120 projects and initiatives in its member countries for an approximate amount of $98.4 million, including contributions from other sources of funding and executing agencies. Its member countries are Argentina, Bolivia, Chile, Colombia, Costa Rica, Dominican Republic, Ecuador, Honduras, Nicaragua, Panama, Paraguay, Peru, Spain, Uruguay, and Venezuela.